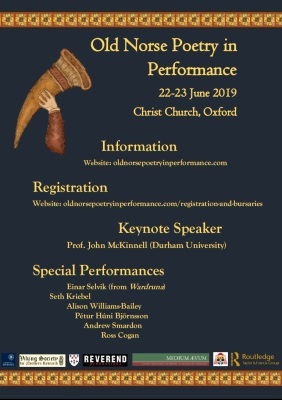 Welcome to Old Norse Poetry in Performance: Text and Texture, an interdisciplinary conference seeking to provide a framework within which both emerging and established literary scholars, actors and dramaturgs can explore the various problems and potentialities surrounding the performance of Old Norse-Icelandic poetry. The website offers information on the concept of the project, contact information, registration procedures, programme details, travel and accommodation arrangements, as well as a list of our generous sponsors. To keep up to date with conference news, please join our Facebook Group where we'll be posting regular updates. Feel free to download and disseminate our conference poster below.